The sad reality is that we have lots to do around here to prepare for winter, and admitting that fall is here is admitting that I have a helluva lot to check off my list yet this year. But instead of worrying about any of that, we chose to take our son, my mom, and my sister to a local pumpkin patch this afternoon. You know, like the good Midwestern Americans that we are. We’ve been going to this pumpkin farm every couple years since we lived in our first apartment together back in 2007. At that time, the farm had a one-car garage full of pumpkins and gourds with a self-serve money box not unlike our own farm stand. It was quaint, it was still kind of a secret, and it was a good way to kill an hour on a fall afternoon. 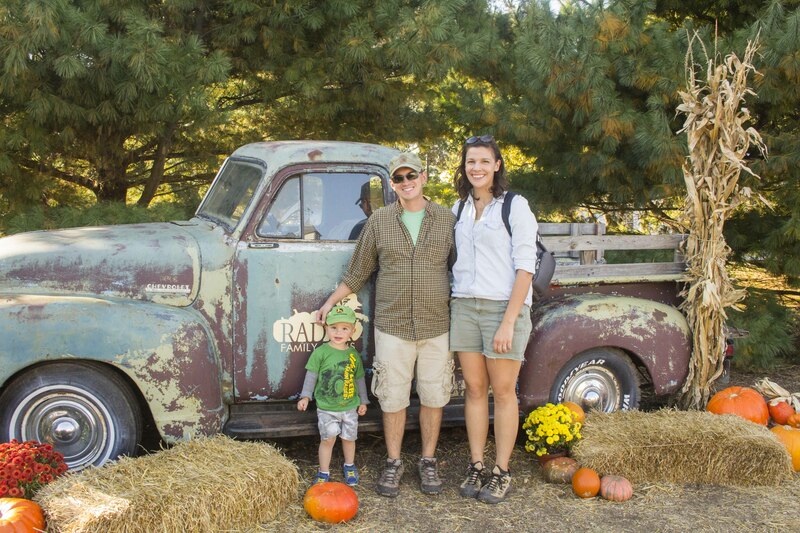 Today, Rader Family Farms is anything but quaint. It is an OPERATION. The place is unbelievable. They have three restaurant areas, countless kids games and activities, and a gift shop the size of a machine shed. The only thing they didn’t have a whole lot of were pumpkins, surprisingly. We can’t blame them for this—it’s been a dismal year for pumpkins around these parts. But who cares, that place is now all about the experience and not really at all about the pumpkins anymore. I admire this family for creating such an impressive farm business in such a short period of time. We have our eyes on making our little hilltop farm into something pretty special too, but holy jack o’ lantern, I hope we never create a beautiful monster like they have. Anyone who knows us is probably aware that we thought we would be these laid back, happy go lucky parents before our son was actually born. We are not those parents. To add to that, we’ve had a fairly stressful year (see all previous blog posts for confirmation), and we haven’t quite let ourselves take a deep breath just yet. And I spend five days a week in a basement classroom and hallway full of teenagers, so I avoid crowds like it’s my, well…I guess that would make it my third “job.” So, to cut off this rant, we had a really nice afternoon enjoying one of the best thought-out and best managed agritourism endeavors that I’ve maybe ever seen, but we were glad to get home, wash the gallon of dirt from our eyes, and enjoy a $5 take-and-bake pizza from Sam’s Club, a company that we revile even more than the aforementioned large crowds. Their pizza was just what the doctor ordered tonight, though. If you haven’t seen it already, pick up a copy of this month’s “News and Views” magazine. You can find them for free in hundreds of locations in the Bloomington-Normal area. We were honored to get two articles published in this month’s issue, and one of Audra’s pictures is even the cover photo. You can also access the online edition here. Next month we’re speaking at a Local Foods Summit at Heartland and right now our goal is to be the funniest, most unexpected presentation there. And we might teach other local growers a few things about how to better share their own stories with their customers. And if you are interested in trading us some of your hard-earned money for 12 weeks of amazingly gorgeous flowers, please check out our 2016 Flower Subscription Service. We would love to fill up your homes with our flowers next year.